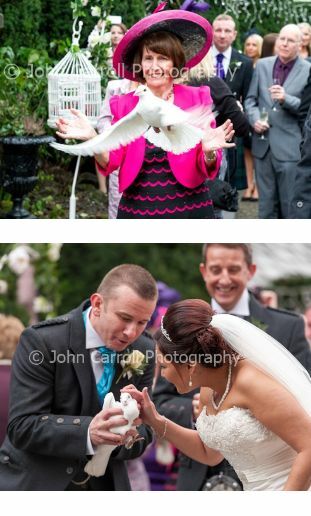 Symbolise your true love with the release of two white birds after your ceremony. This poignant symbol of true love will impress guests and represent the couples devotion for each other. We have a selection of poems on request, or alternatively birds can be released after vows have been spoken. Please see our below packages, as our birds have to fly home we can only attend events in Glasgow and the central belt of Scotland. After your ceremony two white doves will be presented in your choice of ornate cage. This is a great opportunity for friends and family to take pictures to mark your special occasion. The couple will each be handed a bird to release as one and journey home as a pair. The birds will be displayed on arrival in two cages on either site of your venue’s entrance, these can be moved to your favoured location in the grounds of the venue and released as in package one. This provides a great opportunity again for photos and a memorable way to mark your day.